Abel Gance’s extraordinary breakthrough work, J’ACCUSE is a World War I drama considered one of the most technically advanced films of the era and the first major pacifist film, referred to by Gance as, “A human cry against the bellicose din of armies.” This seminal cinematic achievement stars Marise Dauvray as Edith, a young woman who is unhappily married an older man, François (Séverin-Mars), though she’s actually in love with a young poet, Jean Diaz (Romuald Joubé). Both Jean and François end up on the front lines of World War I while Edith is captured by German forces and suffers atrocities at the hands of the soldiers. Gance weaves individual human suffering against the larger horrors of war, depicted with stark realism. 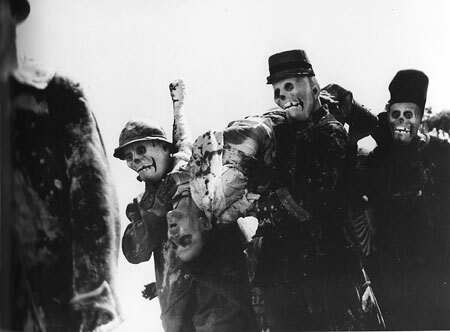 For the famous “March of the Dead” sequence at film’s end, Gance used real soldiers home on leave, many of whom returned directly to the front. J’ACCUSE introduced such technical advances as rapid-cut editing style and highly expressive camerawork and lighting. Gance, who had served briefly in the military, returned to active service in 1919 in order to film real battle scenes to include in the project. The restoration of J’ACCUSE is a joint project of Lobster Film Studios, Paris, and the Netherlands Filmmuseum with invaluable support from film historians Kevin Brownlow, David Shepard and Lenny Borger. The restoration process began by gathering and analyzing all existing film elements in an effort to duplicate the original version as closely as possible. The Netherlands Filmmuseum holds an original tinted and toned nitrate copy in its collection, the only known surviving color version of the film. This print was the source for the color information seen in the present reconstruction. Whenever possible, nitrate prints were the source for digital scanning, allowing for pristine photographic quality. This French-titled edition contains many original art cards with optional English subtitles. There are many extras prepared exclusively for this release; the included booklet contains an extensive essay by celebrated author (The Parade’s Gone By…), director and film historian Kevin Brownlow who conducted the 1980 reconstruction of Gance’s NAPOLEON. Brownlow draws from his research and personal interviews with Gance. Paired with Brownlow’s essay is an additional work from historian Leslie K. Hankins, analyzing the potential influence J’ACCUSE had on the works of Virginia Woolf as well as its lasting impact on artists today. The Netherlands Filmmuseum also provides details on the film’s restoration. Two short films are also included, courtesy of the Blackhawk Films and Lobster Films collections’: 1915’s PARIS PENDANT LA GUERRE (PARIS DURING THE WAR) takes a comical look at Parisian life during wartime and features a newly-recorded Fotoplayer score; and FIGHTING THE WAR (1916), featuring amazing frontline photography of French soldiers, shot during the battle of Verdun by adventurer Donald C. Thompson. The most complete edition of the original 1919 edit of J’ACCUSE, made possible through the joint efforts and material contributions of the Cinémathèque Française, the Netherlands Filmmuseum and the Czech National Film Archive. A new symphonic score compiled, arranged and conducted by Robert Israel. Optional English subtitles supplementing the original French intertitles that preserve much of the original title card art. A 20-page booklet with essays exclusive to this edition: The Waste of War: Abel Gance’s J’ACCUSE by Kevin Brownlow; Abel Gance’s J’ACCUSE and Virginia Woolf’s MRS. DALLOWAY: Re-reading a Modernist Novel by the Light of the Silver Screen by Leslie K. Hankins; and Reconstructing J’ACCUSE by Annike Kross – Nederlands Filmmuseum. Two short films produced in France during World War I, including footage of the battle of Verdun.